I've posted a monkey bread recipe before and its my favorite "special" day breakfast treat. But when I saw this recipe on the blog What's Cooking Chicago, I knew I had to try it. She adapted the recipe from Paula Deen's Gorilla Bread Recipe - which I've actually tried before but wasn't really impressed with. The cubes of cream cheese in the middle of the rolls didn't really work for me. 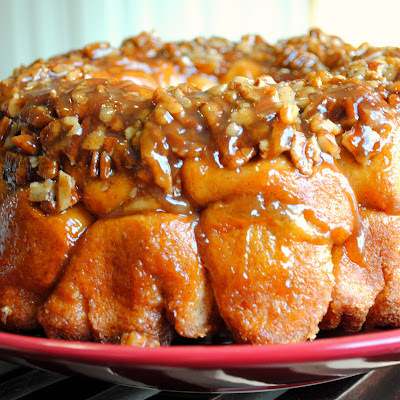 But this version with the cinnamon apple mixture in the middle of the rolls sounded great. 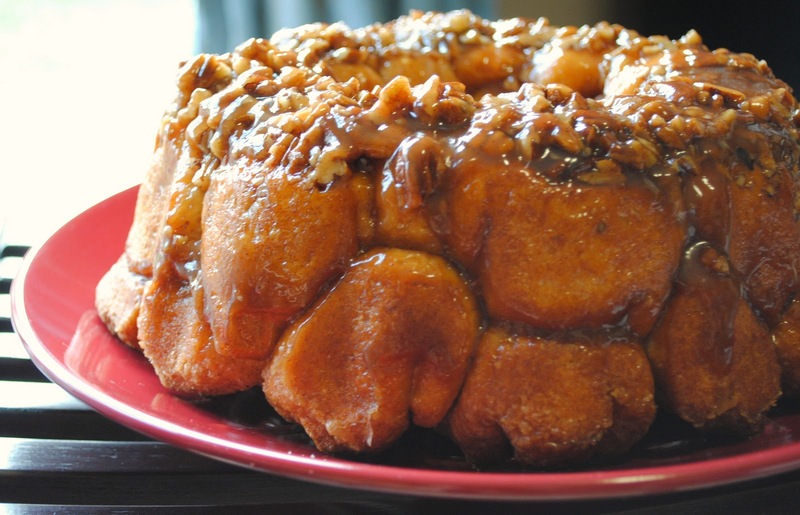 It only takes a few extra minutes during the assembly process (which you can do the night before if you want) and adds an unexpected twist to the classic monkey bread recipe. This would be great for a big breakfast while so many people have family over during the holidays. Add an egg casserole or strata for something savory and some fresh fruit and hot coffee and you have a great, easy breakfast that you can do all the prep work the night before and just bake in the morning. Preheat oven to 350 degrees. Heavily butter a bundt pan. Sprinkle chopped pecans evenly around the bottom of the pan. 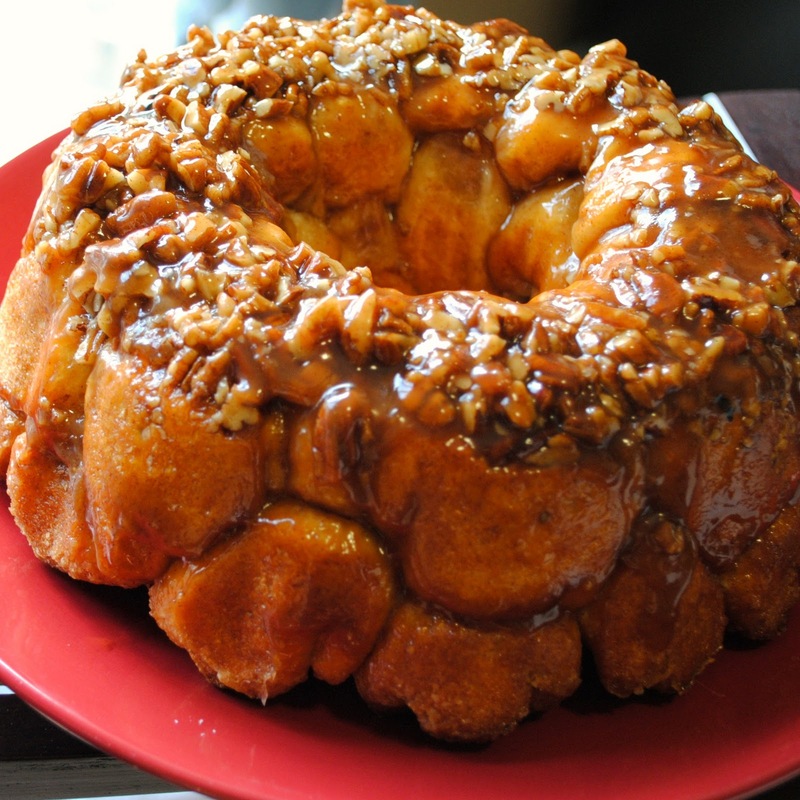 Combine the cinnamon and sugar in a small bowl and set aside. Open biscuits and flatten each individual biscuit into discs about 1/4" thick. Dredge both sides in cinnamon and sugar mixture. Continue until all biscuits are coated. Combine apples with remaining cinnamon and sugar mixture. Spoon about one teaspoon of apple mixture into the center of each biscuit and fold up biscuit into a pouch and seal. Drop stuffed biscuits into the pan, trying to keep the layers even all the way around. Don't worry about packing them in too tightly, they'll fill in the gaps as it bakes. In a small saucepan, melt butter and brown sugar over medium high heat. Heat just until the edges of the sauce start to rapidly bubble and boil. Remove from heat, stir in vanilla and pour mixture over the top of the rolls. Bake about 30-35 minutes until top is golden brown. Cool about five minutes in the pan, cover with a large plate and invert. Uncover and serve warm. THIS looks incredible!!!! Great blog! Happy I found you! Wow, this does look incredible. Wishing you a wonderful Thanksgiving. did you add the topping after you took it out of the pan? I know you said you do it before you bake, but it looks like the topping is on the top of the bread that would have been the bottom during baking. I'd love to try this, just wanted to make sure. @Alanna - you add the topping to the bottom of the bundt pan but when it's done baking you flip the whole thing over onto a plate so the top becomes the bottom. @Mary -- thank you, enjoy the blog! @Paula -- thank you - hope you had a great Thanksgiving as well. Awesome! This is exactly what I was looking for, right down to the apple type. we live overseas and can't get any 'premade' rolls or biscuits, any suggestions on how to supplement that part of the recipe? @Krista - you can definitely substitute any sort of dinner roll recipe. Just make the dough and separate into small pieces in place of the refrigerated biscuits. I'm not sure if you have frozen bread dough but here there are also frozen dinner rolls sold in grocery stores that you could also substitute. I made this tonight- It's amazing! I am going to make this for Easter, If I make it the night before,can I do all of the assembly and then just bake Easter morning ?